Diane Baia Hale is the author of THE MARBLE MUSE (Winner, NEXT ACT! 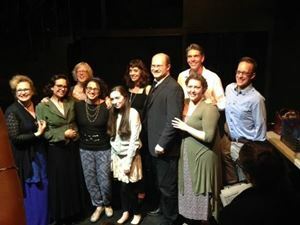 New Play Summit 6, Capital Repertory Theatre; winner, First Flight Festival, Boomerang Theatre Company; 3rd Prize, Stage Play category, 84th Annual Writers Digest Writing Competition; semi-finalist, 2015 Eugene O'Neill Theater Center, National Playwrights Conference; 3rd Prize, Henley Rose Playwright Competition for Women, Yellow Rose Productions; finalist, Theatricum Botanicum, Seedlings New Play Development; finalist honoree, Echo Theatre Big Shout Out New Play Contest; honorable mention, 4th Annual Playwriting Contest, The Ohio State University-Newark.) Other plays include THE WISDOM OF SERPENTS(finalist and Honorable Mention, 2009 Jane Chambers Award), "Rake" (finalist, 2013 Arch and Bruce Brown Foundation Playwriting Award; semi-finalist, 2014 Gay Pride Films and Plays Competition), "The Dragon's Teeth," "Rake," "The Fencing Lesson," and "The Lion's Share." She is a member of the Dramatists Guild and ICWP, and was a 2009-2011 Senior Network Playwright at Chicago Dramatists.